This is a zoom lens manufactured by Tokina and the model was launched 2009. The lens belongs to the category wide angle zoom lenses, a wide angle lens where you have the possibility to zoom in and out. The lens is available for both Canon and Nikon cameras, but there are two different versions of this lens (one for each brand and mount) so it is important that you ask for and choose the right version when bying the lens. This lens is designed and meant for Canon and Nikon cameras with a smaller sensor (often referred to as 'APS-C') which means that the lens does not fit all camera models. By clicking on the link below you can make sure that the lens works with your camera model and you should do an additional check with your local dealer as well, before you buy the lens just to be sure. The lens has a focal length of 12-24 mm. 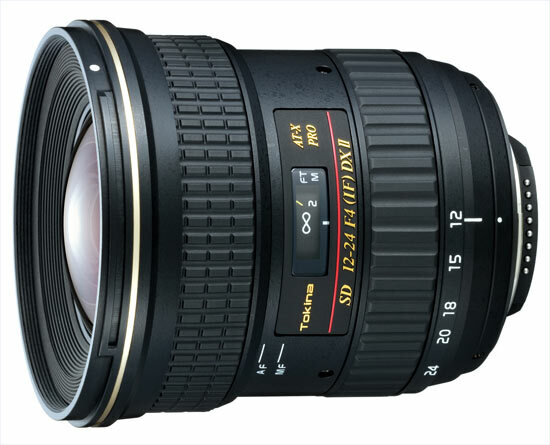 Since the lens is designed to be used on a camera with smaller sensor ('APS-C') the focal length will be equivalent to 19-38 mm if you have a Canon camera or 18-36 mm if you have a Niko camera. The lens is to considered fairly bright. This will make it so much easier shooting in darker environments where you do not want or can use flash lighting, for example in churches or at different sports venues. A feature worth commenting, which is also related to lens brightness, is that the brightness and maximum aperture-value remains constant regardless of focal length used. This makes it easier for you as a photographer. No matter if you are have the focus ring and focal length at 12 mm or at 24 mm the aperture value can be f/4. The lens lacks image stabilization, which otherwise os good for avoiding the blur that can occur when using slow shutter speeds. The lens has a traditional filter thread on the front and its measuring 77 mm which also the filter you will use must have. If you use for example an UV filter can be a cheap insurance against scratches and dust. If you buy this lens it will come with a lens hood, whose model name is "BH-777". This lens has replaced an earlier version and this lens is currently the newest version but please compare it with the earlier versions before you buy it. Text from Tokina: "The Nikon mount AT-X 124 PRO DX II has a built-in AF motor drive. The motor inside the lens was loaded onto the Nikon mount specification anew. The AF operates smoothly and quietly due to a DC motor that uses a new AF control gear assembly. With the built-in motor, the lens can be used in AF mode with the Nikon D60 and D40 and other silent wave bodies. The Canon version of the lens already has a built-in AF motor and will benefit from the improved multi-coating. The optical system of original AT-X 124 PRO DX won awards for its sharpness world-wide. This design was maintained in the AT-X 124 PRO DX II and improved with the introduction of new multi-coating_ system. The new multi-coating helps reduce reflections that can cause flare and ghosting even more than in the AT-X 124 PRO DX. The AT-X 124 PRO DX II features the one-touch focus clutch mechanism. _ To use the one-touch focus clutch mechanism, move the focus ring forward, towards the front of the lens, for AF or back for MF. This allows for a fast and easy manual over-ride in difficult lighting situations. Digital single-lens reflex DX lens_ dedicated to digital SLR cameras with APS-C sized sensors. "